English Tarmac Ltd. has all the equipment and experienced personnel needed to perform all types of site work including excavation, trenching, minor storm drain system installation, and material handling including sand, gravel, and soil removal. We own all of our own equipment such as two planners and pavers, backhoes, loaders, graders, and skid steers, among many others. What this means to you, the customer, is that we won’t have to subcontract out any of our work! This will save you time and money--as we will perform your site work for you prior to the installation of your tarmac solution. At English Tarmac Ltd. we pride ourselves on the quality and efficiency of our work. We have a highly skilled, experienced team who all follow our own strict standards on quality and health and safety. 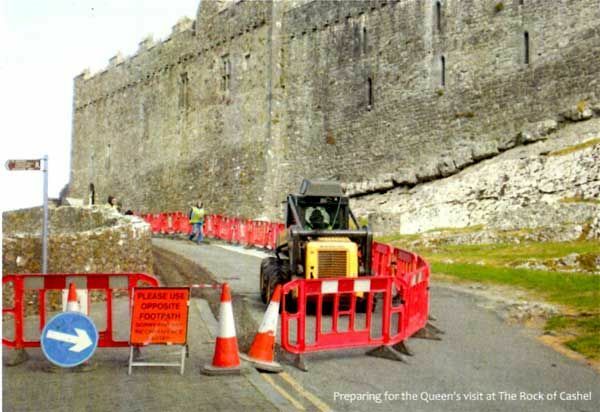 Rock of Cashel - These works were carried out in preparation for Queen Elizabeth's visit to Ireland in 2011.